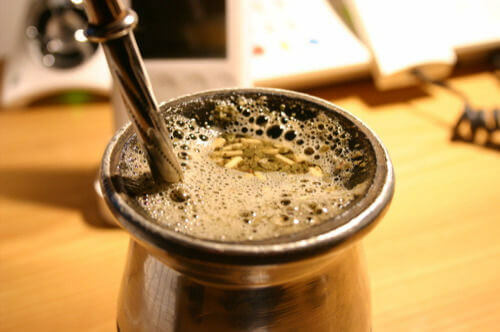 Typically found in Argentina and Uruguay, mate is an drink that has gained global popularity due to its health benefits. It’s prepared with ground yerba mate leaf. These leaves are placed in a vessel – traditionally made from a squash – and hot water is poured on to create an infusion. You can drink it neat (a bit bitter), with sugar or with citrus peel – most commonly lemon or orange. This herb is so good for your body. You’ll find out why in this article. Yerba mate is renowned for its invigorating and cleansing properties. Why? Well, its diuretic abilities are great – and, because you prepare the infusion with a lot of water, you’re increasing its cleansing power. Additionally, it’s loaded with antioxidants, reduces “bad”/LDL cholesterol and promotes “good”/HDL cholesterol. Research illustrates how mate encourages enzymes to work harder and, as a result, it protects your body from cardiovascular illness. It also contains high levels of xanthine – marvellous for your overall well-being. In places where water is not suitable for drinking, yerba leaves can purify the body of bacteria and parasites. This traditional, South American infusion can boost your attention span and enhance brain activity. What’s more, it’s an anti-depressant but not addictive and it contains less caffeine than tea, cacao and coffee. Because it accelerates urine production, it eliminates the toxins that can accumulate in your body. Bear in mind that yerba mate is not recommended for people with anxiety and should be avoided by those with sleep disorders or acute kidney disease. This drink has sometimes been associated with oesophagus problems, but at least one study has shown that this is due to the temperature of the water, not the mate itself. Drinking mate while fasting produces excess stomach acid. Bitter: this is the most common way to drink it – most especially in its native countries of Argentina, Uruguay, southern Brazil, Bolivia and Paraguay. There, it’s called “cimarrón” or “feral” in honour of the horses that accompanied the gauchos, who were the first drinkers of this infusion. Sweet: controversial, to be sure, as traditionalists argue that this isn’t the real mate. If you want to drink it sweet, you can add a bit of sugar, stevia or sweetener. Many women and children in Buenos Aires drink it like this. This type started appearing because of migration. Spaniards and Italians wanted to distinguish theirs from the region’s typical drink. With milk: instead of adding water, use hot milk (try almond or oat) and add sugar. The milk should be lukewarm, not too hot. With herbs: this preparation is known as “yuyos”. Herbs are added on top of or in between the layers of yerba mate in the infusion to add a different flavour or for the other herbs’ medicinal properties. For example: chamomile, eucalyptus, mint, boldo or linden blossom can be mixed with the leaves to address specific complaints. As a tea: yerba mate leaves are put into a tea bag and infused in a cup. This is quite popular amongst children and young people. Tereré: traditionally from Paraguay and the Mesopotamia region of Argentina – home of the Guarani – this infusion is prepared using juice (orange or grapefruit, for example) rather than of water, herbs (chiefly, peppermint or lemon verbena) and even lemon slices. The juice is prepared in a pitcher and is poured over the leaves. Boiled yerba mate: this infusion comes in teabags or in thread form. It is prepared like normal tea, but it tastes like mate. You’ll find that this is most common way mate is prepared in Argentina and Uruguay. How Does Drinking Mate Cleanse My Body? Choose a type and a preparation method that you like and help yourself to a cup every day. According to the experts, if you drink mate in the morning, your body will benefit the most. Many people prefer to drink mate for breakfast, with bread or muffins. For those whose first meal consists of coffee with milk, croissants or pastries, it’s better to drink mate around mid-morning. Still not keen on the flavour? Try sweetening it or drinking the tereré alternative with juice when it’s hot outside.